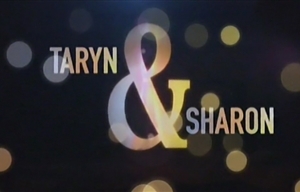 Taryn & Sharon is a South African comedy–drama television series created by Nimrod Geva in which two thirtysomething women are desperately looking for rich, handsome and agreeable husbands to marry and make babies with, not realising that they are joined at the hip and are practically already married to each other. This is a perfect union as they are both unbearably self-involved and completely oblivious of the world around them. Taryn (Melissa Haiden) still lives at home with her doting father, Gary (Russel Savadier) - who will give her anything she wants - as well as with her authoritarian childhood nanny and honorary "mother", Ma Lillian (Lillian Dube), who tends to her every need. Sharon (Amanda du-Pont), having been best friends with Taryn since early primary school, is the family's other daughter who spends most of her time at the house, despite having her own apartment. Since Taryn and Sharon got their diplomas from an expensive private marketing college, they haven't done much in terms of real, honest work. They fancy themselves web-based social entrepreneurs and spend their days cooking up flippant campaigns in order to get into exclusive events in the name of "networking" and meeting eligible bachelors. Throughout the series, Taryn and Sharon navigate the upper crust of the Northern Johannesburg suburbs, colliding with housewives who have "made it" while they, on the other hand, lag behind. But when all is said and done they will always have each other to make themselves feel better. The series stars Melissa Haiden as Taryn, Amanda du-Pont as Sharon, Russel Savadier as Gary and Lillian Dube as Ma Lillian. Other characters include Mary-Anne Barlow as the girls' frenemy Laurie, Fiona Ramsay as Taryn's mother Sandy and Muzi Mthembu as the girls' best friend Fabian. Taryn & Sharon was created by Nimrod Geva and is executive produced for Quizzical Pictures by Harriet Gavshon and Nimrod Geva. Khobi Ledwaba is a producer and the head writer is Karabo Lediga. The title sequence music is by Brendan Jury. The first episode was written by Gillian Breslin and directed by Tim Greene.